Comic book and superhero-movie fans are still reeling from the incredible reveal that Sony and Marvel have worked out a deal to bring Spider-Man into the Marvel Cinematic Universe. The news dropped late Monday night, surprising many as they woke up Tuesday morning to realize that a lot of what they knew about the MCU was now different. We’re still sifting through the pieces, and trying to reassemble the larger puzzle, but from what we can see, we now know when Spidey will make his first official appearance in the MCU. The Wall Street Journal is quoting a source close to the production (or, a person "with knowledge of the matter") as saying that Spider-Man will make his first appearance in Joe and Anthony Russo’s Captain America: Civil War, which is due in theaters on May 6, 2016. This allegedly will set up a solo Spider-Man movie, the first made under the Marvel umbrella, which will drop in theaters on July 28, 2017. This makes all the sense in the world (or, in the MCU) for various reasons. Let’s start with the obvious fact that, in the comic books, Peter Parker and Spider-Man played an integral part in the Civil War storyline, with the hero siding with Tony Stark and revealing his true identity to the world as part of the Superhero Registration Act. The idea of the SRA, and the pending Civil War, is still developing in the Marvel Cinematic Universe, so the inclusion of Spider-Man in that narrative could have a tremendous impact on the world, as a whole. 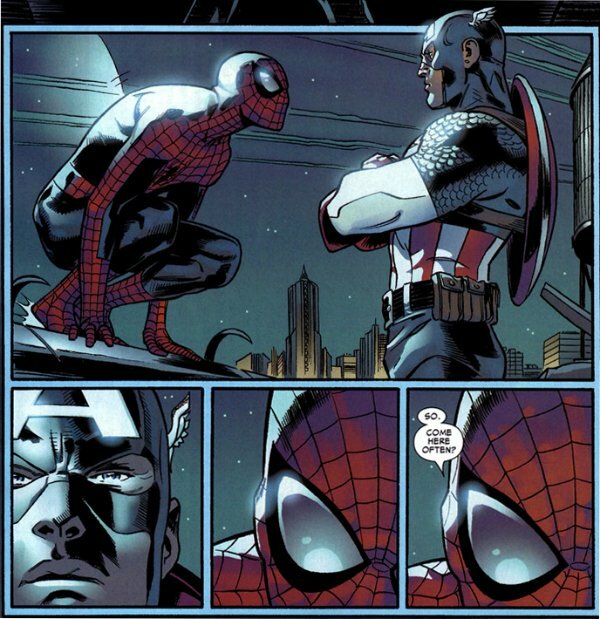 From a production standpoint, including Spidey in Civil War makes practical sense, as well. Avengers: Age of Ultron and Ant-Man are finished. Post-credit sequences on either could be an option, but aren’t realistic when you realize Marvel hasn’t even cast a new Spider-Man yet. After Civil War, the two Marvel films on the calendar set to arrive before the Spider-Man movie are Doctor Strange and Guardians of the Galaxy 2. Spidey won’t be rocketing to outer space to join forces with Rocket and Groot, so the latter is out. A Doctor Strange appearance is possible, given that both heroes should be based in New York City. But I don’t think the grounded nature of Peter Parker fits with what Marvel wants to do with Strange. That leaves Civil War, a film that’s still being scripted and hasn’t begun filming (that gets underway in April). Changes can be made to the blueprint of Civil War to accommodate Spider-Man, now that Marvel has finalized the behind-the-scenes legal work. He doesn’t have to be a major factor of the story, as we already know it will include Iron Man and Black Panther, in addition to Cap. Crowded. All we know is, everything we thought we knew about the MCU has changed as of this morning… and for the better.